We went to visit our friends, Maus and Jen, the other day and Maus gifted me with a beautiful cauliflower from her vegie patch. 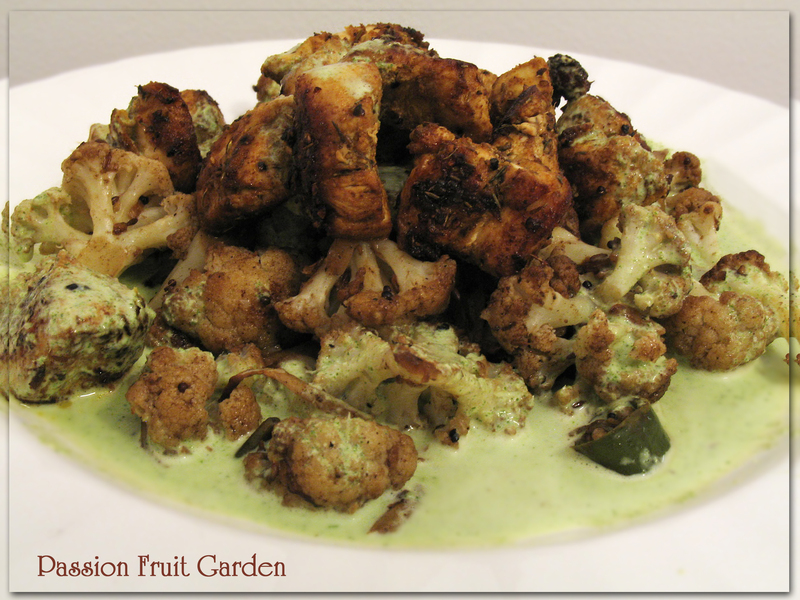 The next night when we were working out what to have for dinner, cauliflower was on the menu. I went into eatyourbooks and typed in cauliflower. I got 146 hits. I quickly dwindled the number down to about 10 recipes and then zoomed in on this one. A lot of the recipes were variations on cauliflower gratin. I wanted something a little different. This recipe is from Madhur Jaffrey’s Quick & Easy Indian Cookery. We decided to have it with Delicious Chicken Bits (Murgh ke Mazedar Tukray) (which we make regularly) and Fresh Green Chutney (Hari Chutney) both from the same book. We usually have the chicken with a salad (which I have previously posted) but thought it would work well with the cauliflower. Here is the recipe for the chicken. Put the oil in a wok and set over high heat. When hot, add the cummin and mustards seeds. As soon as the mustard seeds begin to pop, add the garlic, ginger, cauliflower and chillies. Stir fry for about 7 minutes or until the cauliflower is tinged with brown. Add the salt, black pepper, garam masala and chilli powder. Toss through. Add 4 tbs* of water and cover. Cook for 2 minutes. Serve with Fresh Green Chutney and Delicious Chicken Bits. Blend together 2 tbs* of the yoghurt, the mint, the coriander, the lemon juice and the salt. Add blended ingredients to a bowl with the remaining yoghurt. I was a feeling a bit lazy and blended the lot together. This made the chutney very runny so it obviously was not a good idea. This entry was posted in Vegetarian, What's for dinner? and tagged Coriander and mint chutney, Madhur Jaffrey, Murgh ke mazedar tukray, Sookhi Gobi by Glenda. Bookmark the permalink. Now that looks like something I’d really like to try. This one gets printed out and added to my “do this next week” list.